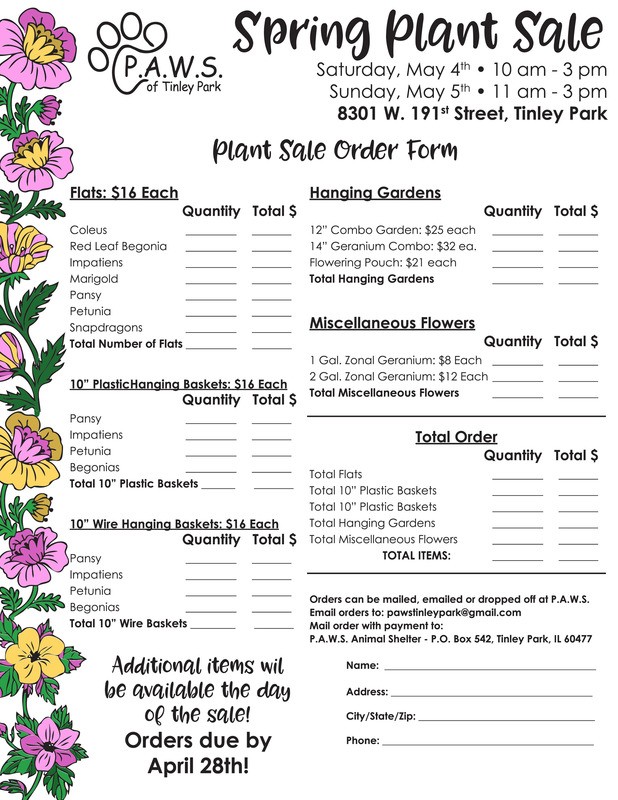 It is time for our Spring Plant Sale! We will have a beautiful selection of flats and hanging baskets. 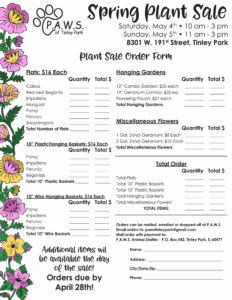 Order forms are due back at the shelter no later than April 28th. 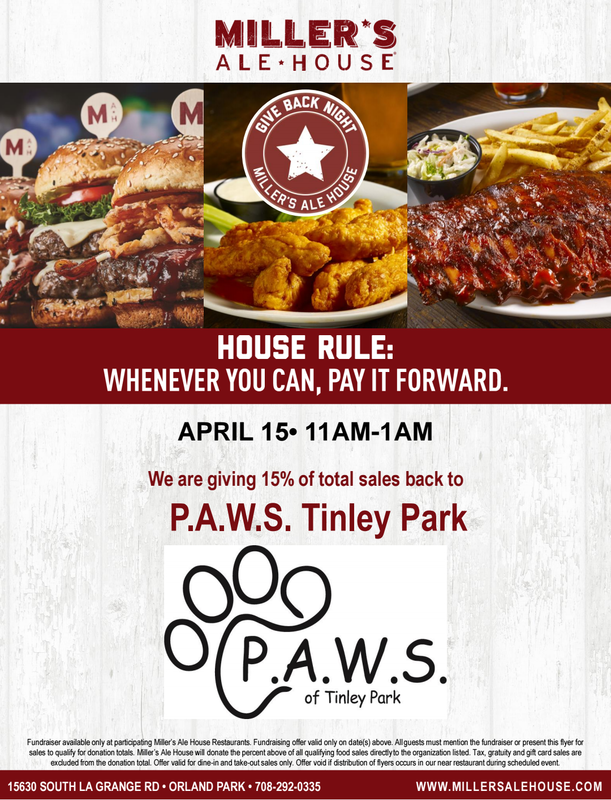 Join us on Monday, April 15th at Miller’s Ale House for a Dine to Donate event! 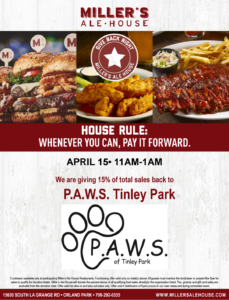 Miller’s Ale House has generously offered to donate 15% of your bill to our animal shelter! You can’t beat delicious food and donating to a good cause at the same time! See you there! We are teaming up with Trina Mae Studio to offer an evening of art & fun on Saturday, April 13th! 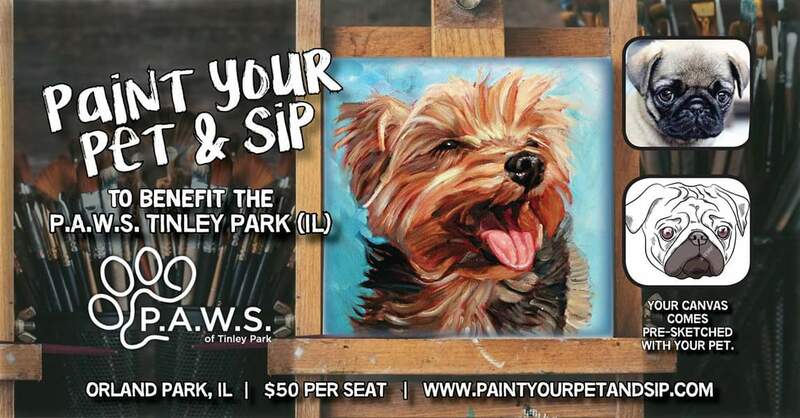 Tickets are $50 per person & include a canvas with your pet’s picture pre-sketched, all art materials & 3 hours of painting. All skill levels are welcome! Minimum of one drink or food purchase required. Purchase your tickets before they sell out! Click here to register! Become a P.A.W.S. member & let your voice be heard! Members are eligible to vote in our general election for the Board of Directors as well as other important decisions that affect our shelter. Dues are paid once annually & are available for individuals, families etc. Follow the link below to register. Members must be registered 60 days prior to the general election to be eligible to vote, so be sure to register no later than February 22nd! Register for membership by clicking here. Hey, Amazon Shoppers! 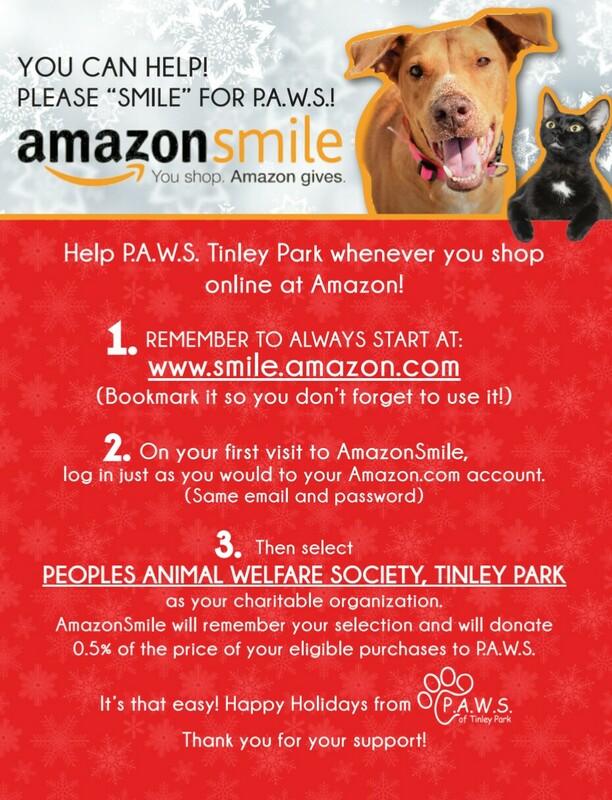 Did you know that the Amazon Smile Foundation will donate 0.5% of eligible purchases to the charity of your choice? 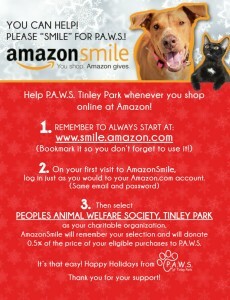 All you have to do is login in to http://smile.amazon.com, select Peoples Animal Welfare Society & go about your shopping! You purchase what you normally would & our shelter gets a donation! It’s a win/win! Be sure to login to Amazon Smile first to make it count. 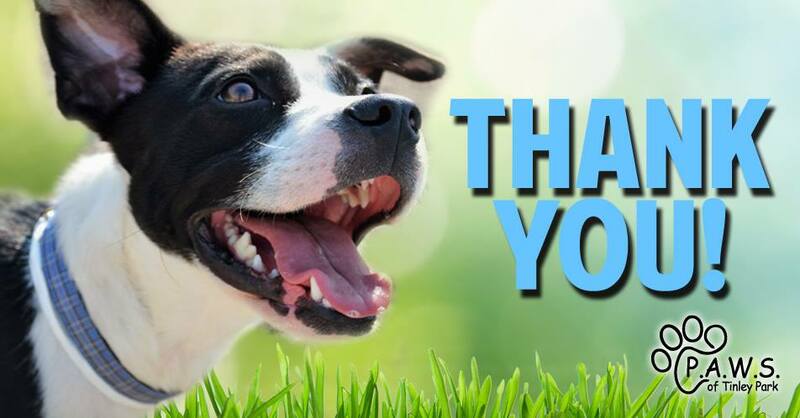 Our animals thank you from the bottom of their furry little hearts! Bonded Seniors Find a Home! 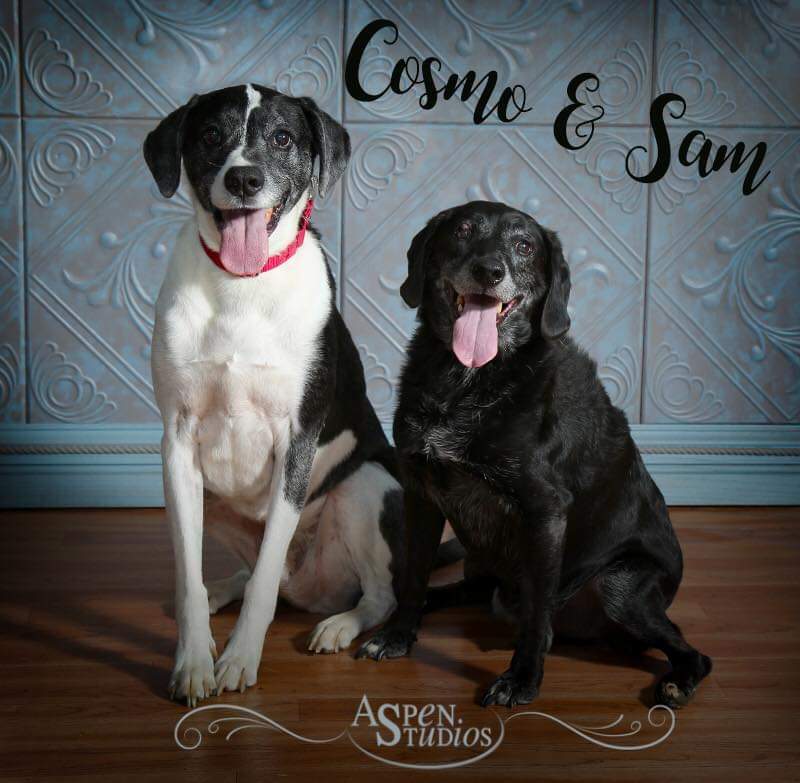 Cosmo & Sam are a pair of bonded seniors who were given up by their owner after 10 & a half years. These lovable dogs were living in a shelter in Indiana from June through November when they were transferred to P.A.W.S. 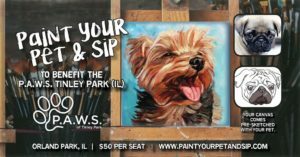 Tinley Park with the hope of finding a home. Cosmo & Sam were posted on Facebook and within one week their post was shared more than 3,800 times & was seen by more than 225,000 people! 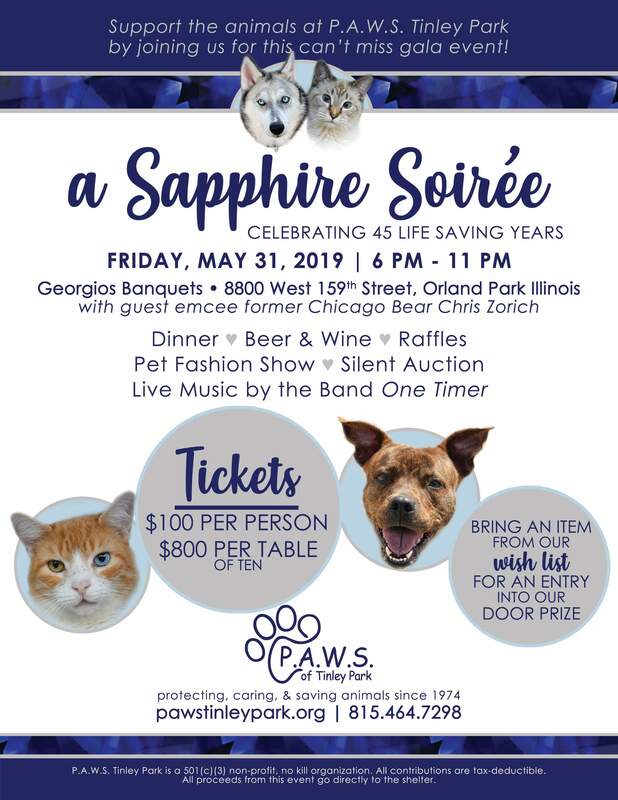 Their story was shared by the Chicago Tribune and WBBM FM radio. We are happy to announce that after all the media attention they received, Cosmo & Sam have been placed in a loving forever home! We are thrilled to announce that we have converted one of our adoptable rooms into a cage free environment for our cats! This room is equipped with hammocks, cat trees & lots of comfy lounging spots for our kitties to enjoy! There are bright, sunny windows & some strategically placed bird feeders outside to provide our cats with plenty of stimulation. 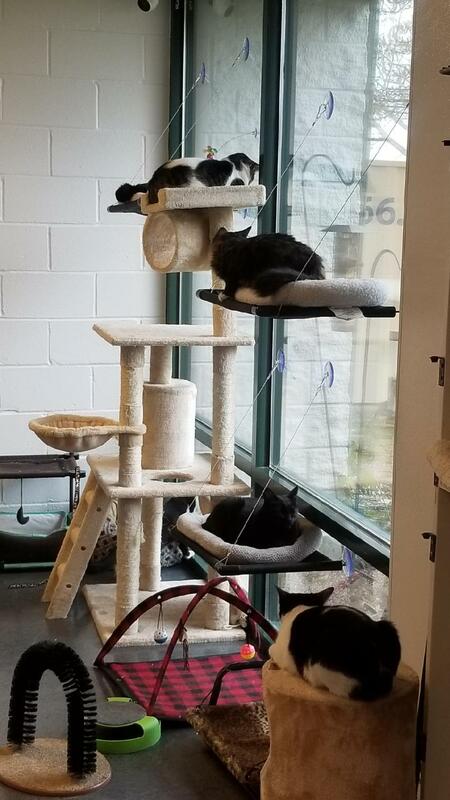 The cats absolutely love this new environment & potential adopters love getting to see our cats’ personalities shining through! Stop by & see how happily our cats are living in their free roaming area! As a non-profit organization, we could not keep our shelter open without the help of our generous Partners. Each of these businesses provides valuable services to the Shelter. 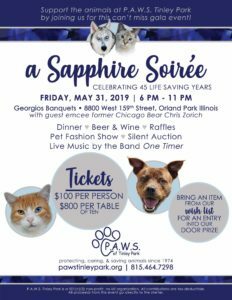 From organizing an event or taking care of our animals and the shelter grounds, each of these Partners plays a special role in helping us with our mission of caring for and finding ‘furever’ homes for our animals.